We’re an architecture and interior design firm located in the heart of downtown Benicia, a charming town in the San Francisco Bay Area. Within our bright and open office you’ll find piles of samples and finish materials, bulletin boards overflowing with ideas and inspiration, an abundant supply of coffee, and a team whose enthusiasm and creativity bring the office to life. We value original thought, creative problem solving, and the drive to do things right. Our goal is to make our clients as happy to come to work every day as we are, by creating spaces that have meaning. We’re passionate about what we do, and we do it well. Paul Roberts is a California Licensed Architect, and one of the founding principles of RBA. From a young age Paul was inspired by watching houses being built, starting with the raw framing of a building and watching the transformation that occurs throughout the construction process. Paul’s career path solidified when he took a drafting class in high school, and he went on to earn his Bachelor of Architecture degree with distinction from California College of the Arts in San Francisco. At RBA, Paul is known for his strategic planning skills, extensive code knowledge, and his loud laugh that carries through the office. When he’s not at work, Paul enjoys playing the drums – especially when he has the opportunity to play in a group, and spending time with his family and his pets. 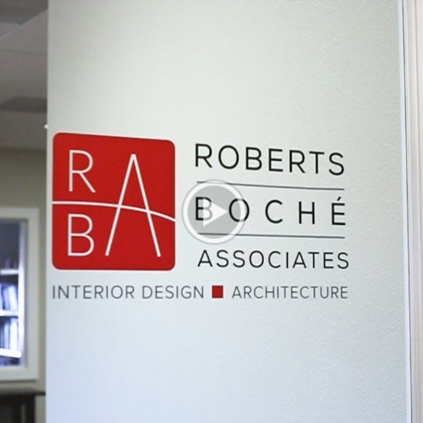 Joanne Boché is a certified Interior Designer, and one of the founding principles of RBA. Joanne always had an innate interest in design. However, an unexpected opportunity leading her to participate in an Architecture and Interior Design study abroad program in London set her on the path to pursue a career in interior design. Joanne went on to earn degrees in both Business and Marketing, and graduated with honors from San Francisco State University with her Bachelor of Arts in Interior Design. At RBA, Joanne is known for her meticulous attention to detail, long standing relationships with clients, and stylish fashion sense. When she’s not at work, Joanne enjoys trying out new restaurants (placing equal emphasis on good design and good food), wine tasting in Napa and Sonoma, hiking, and traveling. Ally is currently studying at Sonoma State University, and returns to intern with us during her breaks from school. Ally’s working towards a Bachelor of Arts degree in Psychology, with hopes of pursuing a degree in social work, but we’re still trying to convince her to switch to architecture. (Kidding!). Around the office Ally is known for her helpful attitude, her cheerful phone etiquette, and being the only person in the office to style her hair differently every day. Outside of work Ally enjoys playing soccer with a local pick-up group, playing with her dog, and being involved with her sorority. Jacqueline realized her passion for architecture when she was in fourth grade and never looked back! She went on to earn her Bachelor of Fine Arts Degree in Interior Design from California State University Long Beach. Around the office Jackie is known for her keen memory, technological capabilities, and her uncanny ability to turn anything into a Disney reference. When she’s not at work she enjoys practicing photography, rooting for the Giants at AT&T Park, and taking weekend trips to Disneyland! Sydney earned her BA in Communication Studies from CSU Stanislaus and joined our team after completing an internship with the Disney College Program. At work, Sydney is known as our Marketing & Project Coordinator, as well as self-designated “Social Director”. Never one to miss a party, she keeps the team in the loop about upcoming industry events and all things social. Outside of work Sydney enjoys going to concerts and music festivals, reading a good sci-fi or fantasy book, and stalking all of the downtown Benicia restaurants and small businesses on Instagram. Danielle grew up walking job sites with her dad, who owns his own contracting company, and knew from a young age that she wanted to be a designer. She completed her BA in Interior Design, with a concentration in Interior Architecture, at Sacramento State University. Around the office Danielle is known for her refreshing #NoFilter personality and her enthusiasm regarding new products and finish materials. Outside of work Danielle enjoys being outdoors, going to local farmers markets, and getting lost in a good book with a cup of coffee. Taylor has always taken notice of the architectural and interior elements of the spaces that surround her, leading her to pursue a career in interior design with the dream of designing her own home in the future. Taylor graduated from California State University Chico, earning her BFA in interior design. At work Taylor is known for her friendly smile and her fondness of PB&J sandwiches. Outside of work Taylor enjoys playing golf, taking trips to the beach, and finding inspiration for her new craft projects on Pinterest. Charlie is the Official Lunch Inspector, Chief Morale Officer, Door Greeter, and RBA’s Best Friend. She’s currently in training with hopes of working her way up to full time employment.